Before Christmas, M and I were invited to the launch of the Britax Römer DUALFIX i-SIZE car seat. However, as the seat wasn’t released until January, we’ve had to keep it all very hush hush! We’ve been lucky enough to have been sent a Britax Römer DUALFIX i-SIZE for the new baby. I’m far too impatient to wait until the baby arrives at the end of March to share it with you! So, I thought I’d do a quick first impressions review now. We’d need to move M’s existing car seat to the driver’s side of our larger car, the Ford Kuga, in order to install the new baby’s seat on the passenger side. Instead, I decided to instead try fitting the Britax Römer DUALFIX i-SIZE in our second car, a Ford Fiesta. As the Fiesta is the best-selling car on the road and has been for some time, I thought it might be useful to lots of people. Once we’re ready to install the Britax Römer DUALFIX i-SIZE in the Kuga and new baby is here to use it, I’ll write a more comprehensive review. For now, here are my first impressions. My first impressions of the Britax Römer DUALFIX i-SIZE are good. Very good, in fact! The seat really wraps around the child, and there’s lots of lovely newborn padding, to keep baby safe and secure. My favourite feature of this car seat is the swivel. The seat can be turned to face the door in order to get the baby comfortably into the seat with ease, then rotated either forward or rear facing, depending on your preference. 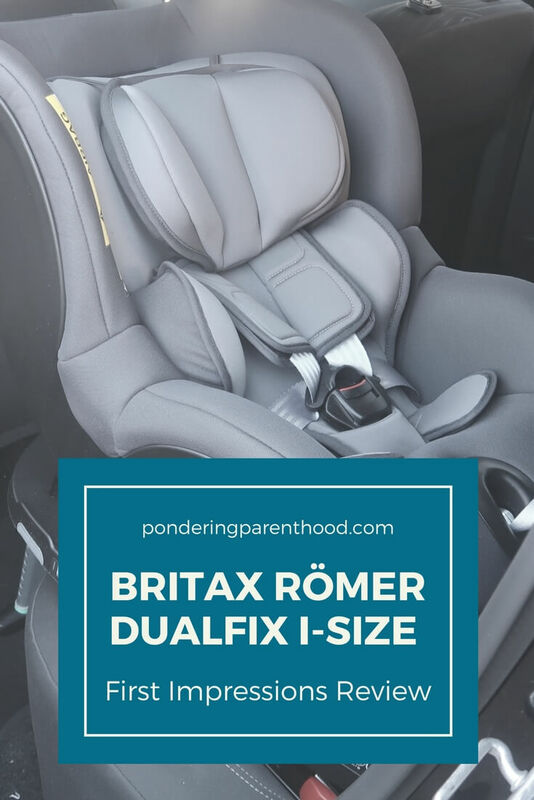 As the Britax Römer DUALFIX i-SIZE can be used from birth up to 105cm (that’s approximately four years), it’s a great option for a extended rear facing car seat. We’ve still got M rear-facing now, and intend to keep her that way for as long as possible! I think I am destined to find fitting car seats by following the instructions on the side of the seat impossible (see my Diono Radian 5 review for reference)! Fortunately, Britax have produced this excellent installation video, which makes it really straightforward to follow and fit. I did find it tricky to fit the Britax Römer DUALFIX i-SIZE in the back of our Fiesta. However, the fact that I’m 33 weeks pregnant might have something to do with it! However, once it’s in, it feels exceptionally secure. 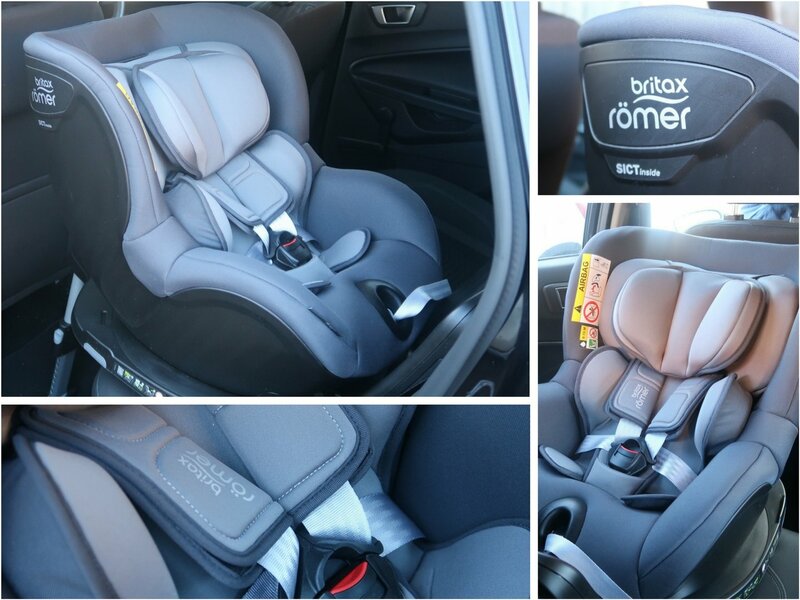 Due to the size and weight of the Britax Römer DUALFIX i-SIZE, this isn’t a seat you’d be wanting to regularly switch from one car to another, anyway. Overall, I’m really impressed with this car seat. I can’t wait for our new arrival to put it through its paces! The Britax Römer DUALFIX i-SIZE retails from £430. Disclosure: We were sent a Britax Römer DUALFIX i-SIZE in order to provide an honest review. All opinions are my own.